Prepare yourself for an unparalleled sensory experience. SAMSARA reunites director Ron Fricke and producer Mark Magidson, whose award-winning films BARAKA and CHRONOS were acclaimed for combining visual and musical artistry. 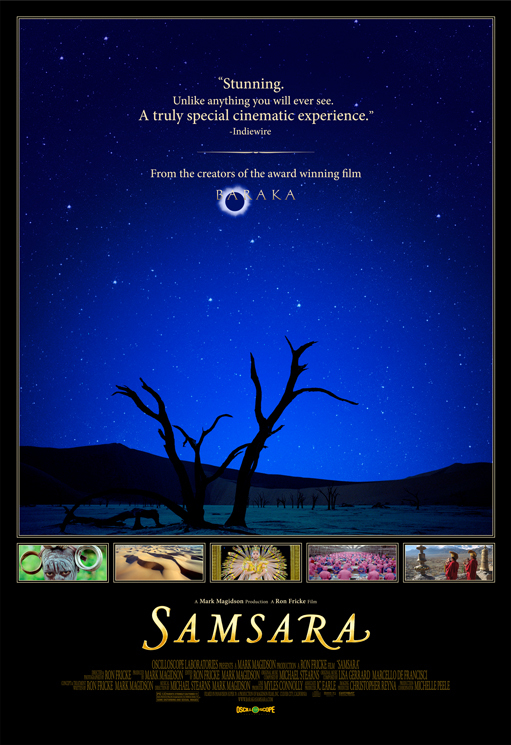 SAMSARA is a Sanskrit word that means “the ever turning wheel of life” and is the point of departure for the filmmakers as they search for the elusive current of interconnection that runs through our lives. Filmed over a period of almost five years and in twenty-five countries, SAMSARA transports us to sacred grounds, disaster zones, industrial sites, and natural wonders. By dispensing with dialogue and descriptive text, SAMSARA subverts our expectations of a traditional documentary, instead encouraging our own inner interpretations inspired by images and music that infuses the ancient with the modern. Rated PG-13 for some disturbing and sexual images.